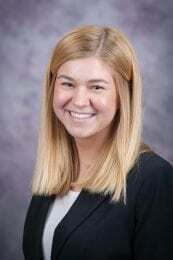 K-State PFA met up with Emily Zwick, who is serving as the internal public relations chair for K-State All-University Open House. Emily is a senior studying agricultural economics from Wichita, Kansas. Following graduation in May, Emily will be working as a supply chain associate for Cargill in Minneapolis, MN. PFA: Thank you for agreeing to share information about Open House with us! To start things off, can you share a couple sentences that describe K-State’s All University Open House? Emily: Sure! Open House is a family friendly event with something for everyone. Join the 20,000 people who flock to K-State’s carnival of academic exhibits, entertainment, food, and fun every year. Don’t miss live entertainment in the Quad and Bosco Student Plaza. Explore K-State’s 250 majors and options, 475 campus clubs, and nine colleges: arts and sciences; engineering; business administration; education; agriculture; human ecology; architecture, planning, and design; veterinary medicine; and technology and aviation (at K-State Polytechnic). 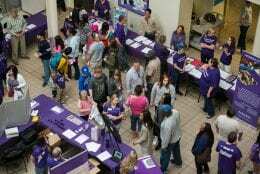 PFA: When is K-State All University Open House this year? Emily: On Saturday, April 6th, Open House will take place on the Manhattan campus from 9 AM – 3 PM, on the Olathe campus 9 AM – 1 PM, and on the Polytechnic (Salina) campus 8 AM – 1 PM. PFA: Tell us about some of the highlights at Open House. Emily: Some of the highlights of Open House include building a toolbox at the Engineering Complex, cheering on your favorite cockroach during the cockroach races at West Waters Hall, experiencing athletic training activities in Hoffman Lounge in Justin Hall, receiving care for your stuffed animal in the small lobby of Mosier Hall, and watching the Lecompton Civil War Reenactors portray debates about slavery, “Bleeding Kansas” and the Civil War in the Quad. Students and families explore various organizations and resources at Open House. PFA: How can a current K-State student engage in Open House? Emily: There are many opportunities for current students to participate in Open House. From volunteering with the Open House Core Committee to helping host activities within your college, performing in the Quad, or representing your student organization at a booth in the Union–each offers a unique way to contribute to the festivities of Open House. PFA: Upon arriving at Open House, where is the best place to begin exploring campus? Emily: In my opinion, the best place to start is the K-State Student Union. At Open House, the Union will offer direct access to our campus busing system, hourly campus tours, distribution of event programs, and numerous informational booths. It is a great starting point before exploring the specific departments and colleges on campus. For a full list of events and times, please visit our website. PFA: For families who have attended Open House before, how can the experience and engagement look different this year? Emily: Each year Open House is packed with new activities, entertainment, and learning opportunities. Even if you have been in past years, I strongly encourage you to take advantage of the 2019 Open House fun. PFA: Describe what a full day at Open House could look like. Emily: A full day at Open House could take on many variations. For example, you could start your day off with breakfast at the Seaton Hall pancake feed, before going to Waters Hall for an airbrush tattoo and bug-petting zoo. Explore the different program tables in the Union, then watch In-A-Chord perform on Bosco Student Plaza. Following the performance, grab a barbecue lunch on Bosco Student Plaza. After lunch, head out to the Rec Center and try your luck on the indoor rock-climbing wall. For an afternoon pick-me-up, stop by Call Hall for a scoop of purple pride ice cream. Make sure to stop by Ward Hall to visit the nuclear reactor, or head over to Trotter Hall to see an amazing two-headed calf. Before leaving for the day, experience life as a K-State student by eating dinner at the Derby Dining Center. PFA: What is unique about Open House that you would not find at other K-State events? Emily: While other K-State events may cater to individuals of a certain age, Open House is a great event for all. The multiple activities provide entertainment for young children, prospective students, current students, family, friends, and alumni of the University. 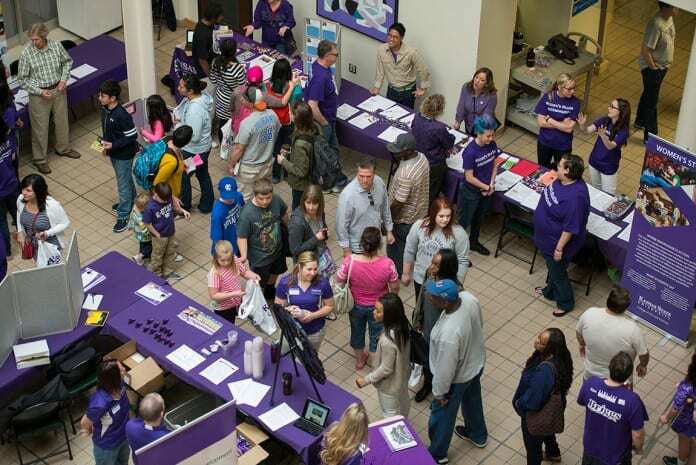 PFA: How is Open House similar or different from K-State Family Day in the fall? Emily: Similar in that it’s opportunity for you and your entire family to explore K-State. During Open House, all our academic homes are open and available for you to explore all aspects of the campus community. Family Day programs are geared more towards activities where your K-State student can share his or her own K-State experience. PFA: What is the best kept secret about Open House? Emily: By completing the Open House passport you become eligible to win a multitude of great prizes! The prize drawing will occur after the Marching Band performs on Bosco Student Plaza at 2:30 PM. Some prizes this year include tickets to a Kansas City Royals game, family passes to the Flint Hills Discovery Center, Stag Hill Golf Club certificates, and family passes to Sunset Zoo. PFA: Open House sounds like a great time for everyone! Thank you for sharing with parents and families! Emily: No problem! We hope to see everyone there!